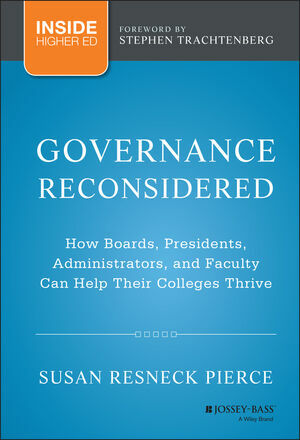 Governance Reconsidered: How Boards, Presidents, Administrators, and Faculty Can Help Their Colleges Thrive takes an in-depth look at the current practice of governance in higher education and explores solutions for more effective functioning. Written by a former college president, the book provides an insider's perspective on the growing tensions around the traditional shared governance model and identifies the key challenges facing trustees, presidents, senior administrators, and faculty. The book also addresses the brand new challenges that affect higher education governance, including MOOCs, online learning, and rising questions about value and cost. Campus leaders must work together effectively to boost higher education, and Governance Reconsidered contains the questions and answers integral to implementing effective governance. SUSAN RESNECK PIERCE is president emerita of the University of Puget Sound. As president of SRP Consulting, she advises colleges and universities on planning, effective board and presidential performance, board development, governance, and fundraising. She is the author of On Being Presidential: A Guide for College and University Leaders (Jossey-Bass, 2012).